Whether you see it as a smart coupe or a sleekly-styled three-door hatch, Kia's second generation pro_cee'd offers a sensible spin on sporty motoring that offers extra bite in this revised GT form where it gets bigger brakes, a smarter look and a sportier engine note. It's also well built, aggressively priced and comes with a bullet-proof warranty deal. Still sensible then, but with a little sexiness thrown in. Has there even been a properly regarded Korean sports car? We've seen some cars down the years that were vaguely sporting in tone, if not in ability. Cars like the Hyundai Coupe offered a glimpse of what was potentially available but there was never the corporate will to really press on, despite high-profile rallying campaigns with no sports products to sell off the back of them. Kia seemed particularly reticent to step up to this particular plate, preferring instead to major on meek and mild. That changed to a degree with the introduction of the pro_ceed model in 2008. Here was a three-door Kia cee'd that looked good, had a willing chassis but just needed a bit more engine than the 138bhp turbodiesel that was the flagship motor. We got an improved pro_cee'd model in 2011, but here the most powerful engine was a 126bhp turbodiesel. Not promising for sports fans. They had to wait until the unveiling at the 2013 Geneva Motor Show of the pro_cee'd GT. 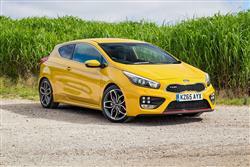 With 201bhp, it was the first performance hatch that Kia had ever built. Now the brand has upgraded this GT model so that it looks, stops and sounds better. Buyers of humbler pro_cee'd models always knew that there was the kernel of a really good car in there. Through the turns, there's a reassuring amount of front end grip, the ride/handling compromise is well judged and there's a nice consistency of control weights. All the sorts of stuff that keen drivers look for in other words. And the engine? Well you'd think that most hot hatch buyers would be satisfied with the 201bhp turbocharged four-cylinder 1.6-litre petrol unit on offer, good for a hefty 265Nm of torque. You can now hear it better in this revised model too thanks to the addition of an 'electric sound generator', one of those sound symposer gadgets that emphasises the engine note in the cabin as you accelerate. It makes quite a nice noise as you accelerate to 62mph in 7.3 seconds. And you'll be able to scrub off that speed a little more easily now thanks to the installation of larger brakes, the bigger callipers for which peep out from between the spokes of the smarter 18-inch alloy wheels. As before, the steering is still a little lighter than really committed enthusiasts will want but it's direct and allows the car to change directlion sharply. The ride's good for a hot hatch too and the six-speed manual gearbox feels slick. This revised pro_cee'd GT gets the smarter bumper lately fitted to humbler pro_cee'd models and an attractive set of 18-inch alloy wheels. Otherwise, aesthetically, things are much as before, so this remains a handsome, wedge-shaped three-door hatch, designed by Europeans for Europeans. Built in Slovenia under the auspices of the Frankfurt-based Kia Motors Europe design team, it features a longer and lower profile than the five-door car, resulting in an edgy, coupe-like shape. The front end now features Kia's 'tiger nose' grille to lend it a bit more attitude. A sharply raised beltline and a sharp crease leading into the rear arches disguise the fact that it rides on the same chassis as the cee'd and features the same windscreen angle. Other than that, only the bonnet and front wings are interchangeable parts. Inside, the fascia layout remains neat, though there are still rather a lot of buttons. The asymmetric, driver-focused dashboard looks classier now though, receiving flashes of chrome around the instrument binnacle, the air vents and around the upper edge of the instrument panel. The central fascia panel is now finished in a high quality, anti-scratch gloss black for a more premium look. Other chrome highlights have also been added to the cabin, in particular around the base of the gear-stick, on door handles, and to the temperature control dials on the dashboard, depending on trim level. There's also an optional colour pack to make the cabin feel more individual. Out back, as before, there's a 380-litre boot. Push forward the split-folding rear bench and you can free up a useful 1,225-litres of total fresh air. Priced at around £23,000, the GT looks reasonable value against other similarly styled and powered compact coupes like Volkswagen's Scirocco and Peugeot's RCZ. Equipment levels include all the expected features - things like air-conditioning with cooled glovebox, heated and electrically-adjustable door mirrors, remote central locking and an MP3-compatible CD stereo with USB and auxiliary inputs. There's also a leather-trimmed steering wheel with audio controls, cruise control and electrically-operated folding door mirrors. As for the really sporty stuff, well customers get distinctive LED daytime running lights, dual-exhaust pipes, 18-inch alloy wheels and eye-catching red brake calipers. Jump inside and you'll spot Recaro sports seats and a cleanly styled, well-built interior. Also designed in is the option for a fully integrated satellite navigation system complete with European mapping and a seven inch colour touch screen. Plus Kia offers a Bluetooth hands-free system and a rear-view parking camera. Kia's normally aspirated 1.6-litre petrol engine does extremely well at the pumps and in this turbocharged guise it returns 38.2mpg on the combined cycle and puts out a competitive 171g/km of CO2. Used values will be propped up quite nicely by the brand's excellent warranty arrangement. Buyers get full cover for seven-years or 100,000 miles. It's one of the best in the industry not only for duration but also for a refreshing lack of troublesome clauses. This promise of trouble free motoring will be enough to tip the balance for many potential customers. Insurance ratings should also be very reasonable, predicated upon a low cost of repair and excellent safety provision. This pro_cee'd GT will introduce new buyers to the Kia brand, which may also have a beneficial effect on the used valuations of other Kia models. It's a win-win in other words. The Kia pro_cee'd GT remains an under-rated car, whether you see it as a sports coupe (as its maker does) or a three-door hot hatch. Aesthetically, it remains a really smart piece of design, with its deeply sculpted flanks, sharply-rising belt line and pinched, aggressive-looking front end. The most recent changes give the car a bit more showroom and test drive appeal - the sleeker look, the rortier soundtrack - but ultimately, the overall recipe on offer here hasn't much changed. We hope this is the start of a series of more sporting Kias; cars that can lift the brand clear of its bargain basement beginnings. One thing's for sure. It looks the part already.